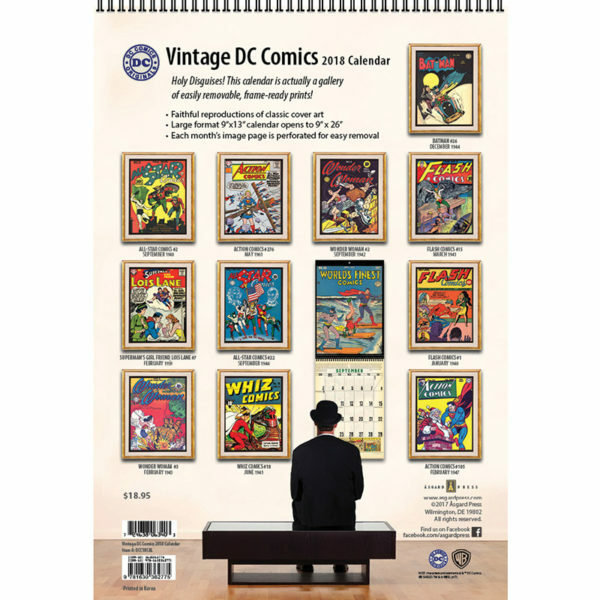 Welcome to Tales from the Calendar, where I write about the comic behind the cover featured that month (or, in some cases, a prior month) in the 2018 Vintage DC Comics Calendar from Asgard Press. This time out, we take a look at World's Finest Comics #36, with a cover by the great Win Mortimer. Of course, their copy has seen better days. If you've been following along, you'll know that this is extremely behind schedule. I try to get these out during the month in which the cover is featured. World's Finest #36 was the September entry in the calendar, so this has lingered quite some time. This is partly due to my own hectic schedule, but I have another (I think good) reason for delaying this. 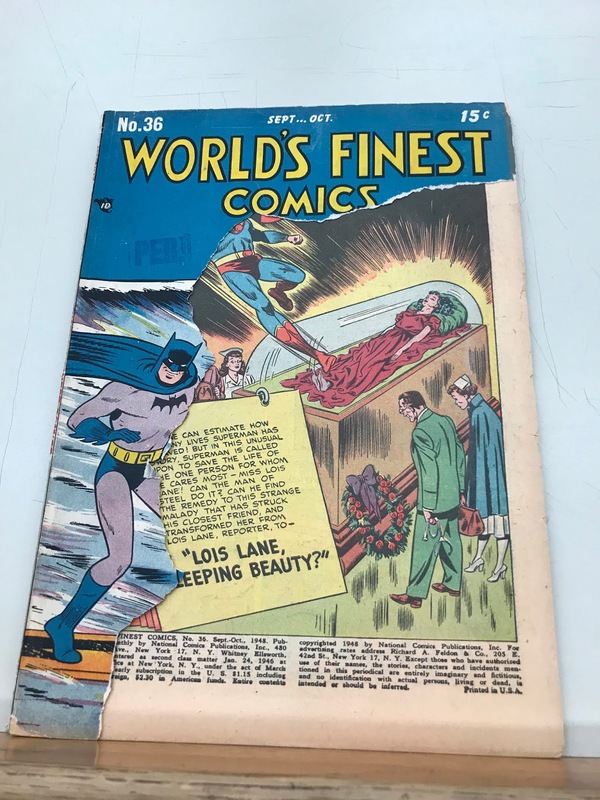 You see, World's Finest #36 is one of the few entries in the calendar for which I own no reprints of any of its stories. I could just do some online research and see what summaries I could find online, which is something I do for stories I don't have possession of, but an entire issue of that was unappetizing. Thankfully, I live near the Library of Congress and it has a copy of it in its collection. So this post not only will feature an issue I've read all the stories in, it's an issue I've actually held in my hands. And it came with the side benefit of motivating me to get my own researcher ID at the Library of Congress. 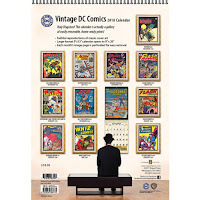 Win Mortimer is one of those great Canadian comic book artists, part of a lineage that includes Joe Shuster, Ken Steacy, Darwyn Cooke, John Byrne, Todd McFarlane, Chris Bachalo, Dale Eaglesham, Tom Grummett, and Stuart Immomen, among many, many others. Mortimer joined DC after brief military stint during World War II. His early work revolved around the Super and Bat books, and he launched the Robin feature that appeared in Star-Spangled Comics. He replaced the legendary Wayne Boring on the Superman newspaper strip for seven years. His later work featured a number of Legion of Super-Heroes stories and the creation of Stanley and His Monster, a strip which would eventually take over the title it appeared in. Fans of my age will recognize him from his work on Spidey Super Stories, the Electric Company tie-in at Marvel. 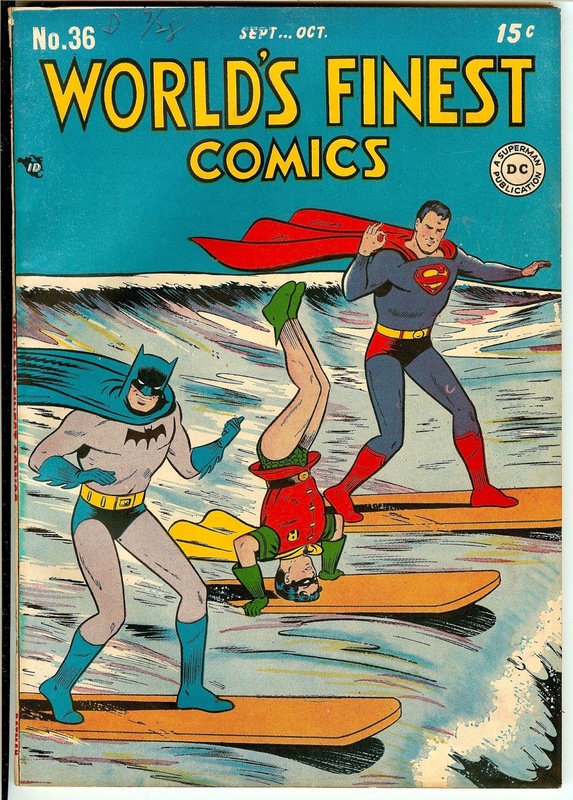 World's Finest #36 was cover dated September-October, 1948 and hit the stores that July. It was a time that combined hope and turmoil globally. The world was continuing to heal from World War II, which had ended a scant three years prior. When the issue hit the stands, the London Olympics were just opening, the first games played since the 1936 Games in Nazi Berlin. The US desegregated its military, but at the same time, the House Un-American Activities Committee was going full bore, continuing its witch hunt for potential communists and other "disloyal" citizens, like Alger Hiss, a State Department official who was called to appear in August. France and the Netherlands both acquired new leaders, while North Korea split off from the South. India, which had just gained its independence, decided to do what free nations do, and invaded the State of Hyderabad. 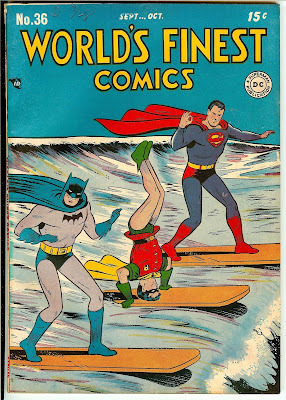 World's Finest Comics was, at the time, an anthology that published stories of characters that were popular enough to warrant additional exposure on top of their regular books. 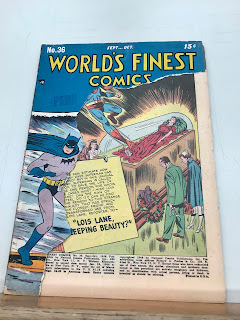 Titled World's Best Comics for just the first issue only, World's Finest always featured both Superman and Batman stories until 1954, when the format switched to show Superman and Batman teaming up together in the same story. The title lasted until 1986, almost always maintaining the Superman/Batman team-up format, until it was canceled to make way for the Superman reboot overseen by John Byrne. I'm unsure if this was the format for every anthology issue of World's Finest, but this particular issue was bookended by the two top heroes. 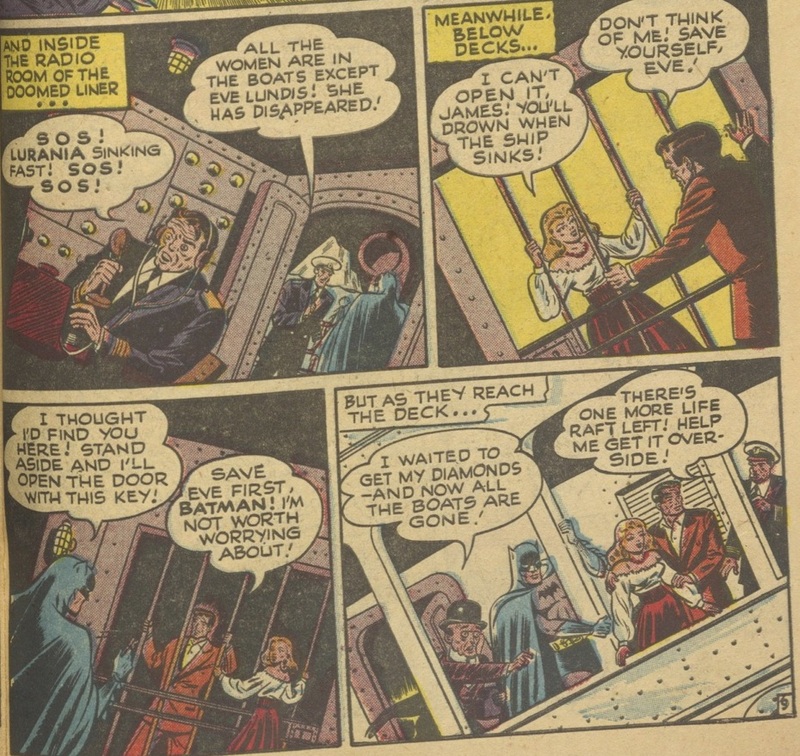 The first story of the issue features Superman in "Lois Lane, Sleeping Beauty?". It's Lois's birthday, and a playwright chooses that day to attempt suicide in front of the Daily Planet theater reviewer, who'd given him a bad review. After his attempt is thwarted, Lois convinces him to hold off on another attempt until she meets with him the next day. That day, the Planet staff visit the local museum, where they learn of a mummy's crypt exhibit featuring an allegedly cursed ruby. Lois touches the gem and falls asleep for "1000 years". However, it's all a hoax, as the doctor who rushes to Lois's aid is actually the playwright, and he and Lois hope the hoax serves as an effective advertisement for the playwright's adaptation of Sleeping Beauty. To keep him busy, the playwright, as the doctor, sends him roaming across the globe looking for ingredients to an ancient cure for Lois's fake malady. Superman is able to do a lot of good during his ingredient hunt, but comes back suspicious of the scam. He fake reveals his identity to Lois to make her reveal the hoax. Superman then helps the distraught playwright get his play produced and Lois is forgiven. "Lois Lane, Sleeping Beauty?" was produced by the team of William Woolfolk and Wayne Boring, with Stan Kaye inking. I've talked about the art team of Boring and Kaye back when I talked about Superman's Girl Friend, Lois Lane #7. They were an ongoing team for Superman for twenty straight years, starting in 1943. I talked about William Woolfolk in the first Tales from the Calendar. The Shakespeare of Comics worked all over the industry, including on such illustrious characters as The Spirit, Captain Marvel, and Archie. And so the handlebar mustache fad came to an end. Following a full page Wheaties ad featuring Ewell "The Whip" Blackwell (a pitcher for the Reds at the time) is Doc and Fatty in "Doctor Fatty and Mr. Hyde". Doc and Fatty had a "time typer", a typewriter that could take them through time. In this story, it takes them to to a lab where Fatty drinks a potion and turns into a monstrous man. Fatty terrorizes London snipping off mustaches with a pair of gardening shears. Doc rescues Fatty and turns him back to normal. They escape via time typer just as the door to their hideout is busted down. The next day, Robert Louis Stevenson is inspired by the stories of their high jinks to write his book, Dr. Jekyll and Mr. Hyde. Doc and Fatty were written and drawn by Howard Sherman. Sherman is perhaps best known as co-creating Doctor Fate alongside Gardner Fox. Sherman stayed with Fate through most of his run in More Fun Comics, then stuck with DC until 1963 when he left comics altogether. He spent a portion of his remaining career designing packaging for a toy company and then working in advertising. One of the struggles he had in comics was matching the "house style" that various characters and titles had. Next up is the Boy Commandos in "The Legion of Death-Cheaters!". Captain Rip Carter and the boys rescue partygoers whose boat catches fire. Rip uses mouth-to-mouth to revive the host, Dudley Perkins. Both Perkins and Carter are immediately contacted by The Legion of Death-Cheaters, a club of men who've died and come back (their motto, presaging the Challengers of the Unknown: "We live on borrowed time"). At the meeting, each member tells their story of how they died and came back. One of the members, Primo the astrologist, has a vision that they'll all die again, in the same manner that they each died the first time. Right away, members start dying as predicted. However, Rip realizes quickly that it's murder and not fate. The killer is Perkins, who is actually an imposter. He traps Rip on the real Perkins's submarine-yacht (you have to love these old millionaires and their excesses), but the boys rescue Rip before faux-Perkins can launch him out a torpedo tube. The Boy Commandos were created by the legendary team of Simon and Kirby, but this particular tale was produced by George Kashdan and the amazing Curt Swan. Kashdan bounced around comics and animation, writing superhero comics as well as war and horror comics, co-creating Tommy Tomorrow and writing scripts for cartoons like The Mighty Hercules and The Superman/Aquaman Hour of Adventure. Curt Swan, of whom I've written about multiple times, replaced Wayne Boring as the Superman artist in the 1960s and continued his primacy over the character through the mid-1980s. A Casey the Cop strip separates the Boy Commandos from the next feature. In this strip, Casey arrests a hobo for loitering, only to find out that the hobo is a walking advertisement for a tailor. Because shoving arrows down your shirt is just soooo comfy! 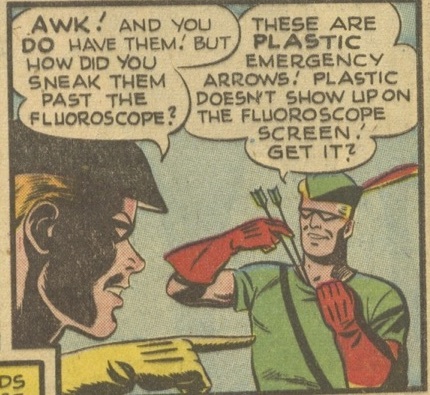 Next up is Green Arrow and Speedy in "Crime for a Hobby!". The story finds our heroes on their way to Hobby Island, home of the Hobby World's Fair. Roy Harper (Speedy) is going to show off his collection of arrow heads. Our heroes don't know that the villainous Mr. Gadget is planning to rob the fair with guns and remotely piloted planes that have been snuck through the security of the fair as toys themselves. GA and Speedy are able to fight the bad guys effectively despite not having their bows and arrows due to the security on the island. It doesn't prevent Green Arrow from getting captured, however, and he is tied to a toy train that will send him right into a water tank to drown. Speedy rescues him by electrifying a model of the Empire State Building that was made of pennies and shocking the bad guys. That's when Green Arrow reveals he's been carrying around two plastic arrows stuffed down his shirt this entire time (seriously?) and uses them to put away the bad guys. This Green Arrow tale was written by Ed Herron and drawn by his co-creator, George Papp. Though he didn't co-create Green Arrow (Mort Weisinger worked with Papp to do that), Herron wrote many Green Arrow tales. He also is credited with creating Captain Marvel Jr. and the Red Skull, as well as later heroes like Cave Carson, the western hero Nighthawk, and Mr. Scarlet and his partner Pinky. Besides Green Arrow, Papp co-created Congo Bill and drew the first appearances of Bizarro and the Phantom Zone. The book takes a quick break with a short biography and a humor strip. "Walter Scott, Mystery Man of Death Valley" talks about the mystery behind where "Death Valley Scotty" gets his money. Rumors are of a gold mine he's found out in the desert. Men have tried following him to find it, but end up getting lost and dying out there. Other rumors say he got his money from a patron, the millionaire Albert M. Johnson (according to his Wikipedia page, Scott had several patrons besides Johnson). The humor strip, Daddy and Doodle, features a man putting a coin into a "fortune and weight" scale that tells him he's a spendthrift, then proceeds to put all of his money into the scale hoping to get the fortune that says he's actually thrifty. This would be so much easier than enacting ID laws. Following that break is Zatara in "Mayor of the Muggs". It's election time and supporters of one of the candidates, Horgan, try to strong arm votes. 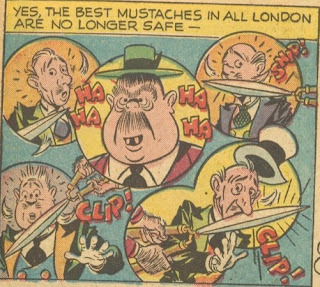 Zatara steps in and makes all the Horgan thugs campaign for his opponent, Walter Dale, instead. More Thugs break up a Dale rally, but Zatara makes their own bats and the arena chairs attack the thugs instead. Horgan's thugs then try to cast fake votes to steal him the election, but Zatara casts a spell to summon everyone in the voter registry, resulting in dogs, babies, and the ghosts of the dead all showing up at the polls. 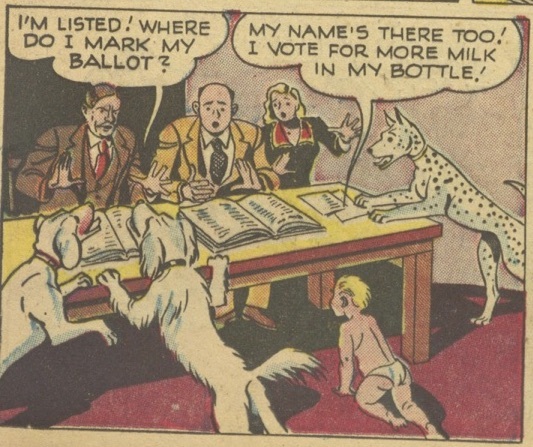 Even with all these activities thwarted, Horgan is still winning during the public vote count until Zatara enchants the ballots to speak out and they reveal that they're all fake. The ballots themselves take out the bad guys and Dale is declared the legitimate winner. Zatara was created by Fred Guardineer and premiered alongside Superman in Action Comics #1. This particular tale was written by Joseph Samachson and drawn by William White. Samachson was a biochemist who left the field to become a writer. He split his writing focus between comics and science fiction, writing a host of characters throughout the Golden Age and co-creating the Martian Manhunter at the dawn of the Silver Age. William White was a longstanding Zatara artist, working with a number of writers throughout the strip's history. Decades later, James Cameron filmed an adaptation. Wrapping up the issue is Batman and Robin in "Ship of Destiny!" The Dynamic Duo stop a robbery, but Batman is shot in the shoulder. Robin books Batman on the cruise line Lurania to get his partner to relax. 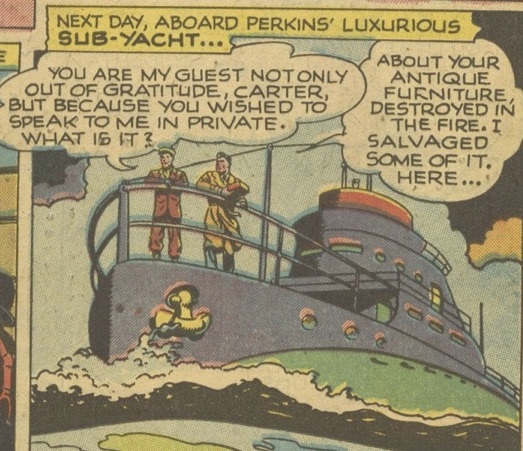 It's not destined to be that relaxing though, because all the passengers Bruce Wayne meets is hiding secret troubles. One of the passengers, Mr. Thorn, organizes a robbery with a plan to pin it on James Rand, who is secretly wanted by the police. Thorn is dressed as a gaucho and Bruce notices that he's a lefty by how he uses his bola. After a quick costume switch, Batman has everyone write down their name to reveal who the lefties are. Realizing he'll be caught, Thorn makes a break for it, just in time for the ship to hit an iceberg. The movie star Eve Lundis tries to rescue James from the hold where he's being kept prisoner in a scene straight out of Titanic. They take the last life boat to safety, but Thorn and his goons return in a motor boat (and it's unclear where that came from) to rob the rich Mr. Kinn of his hoard of diamonds that he's been carrying on the ship. Before they can do so, though, the villains get hit by an iceberg and drown. Rand is proven innocent of his crimes and walks into the sunset with Eve while Batman returns to Robin happy with the resolution. This Batman story is credited to Bill Finger and Bob Kane. You might know them as the guys who invented Batman. 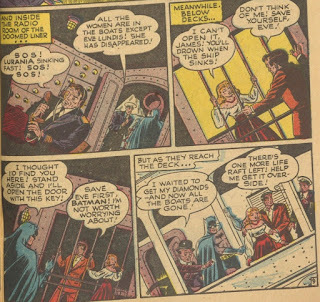 Not that you'll see Finger credited as such, thanks to a deal DC struck with Bob Kane years and years ago. That's a story for another time, but worth discussing nonetheless. That's it for the September calendar page. I'll be back soon with a write-ups on the October and November pages. JL Franke is a fan of both hard science fiction and hard fantasy. He has been collecting comics for over 40 years and has been an on-and-off active member of online fandom for 25. Those interested can find other writings at his personal blog, NerdlyManor.com. He's also started a weight loss blog about his own journey, 200poundsandcounting.com. When not geeking out, you may find him at a baseball park or cheering on his favorite college and pro football teams. In his spare time, he is chief scientist for a research and development laboratory somewhere in the Washington, DC greater metropolitan area.